Mount Carmel Lodge, No. 155, F. & A. M.
This Masonic Lodge was Instituted in Red Dog, Nevada County, Calif., May 27, 1862, under a Dispensation recommended by Clay Lodge, No. 101, Dutch Flat, Placer County, and received from Grand Master Wm. C. Belcher. The Lodge received its Charter May 14, 1863. The first returns to the Grand Lodge were filed in 1863 and it showed the Charter Members, with Charles M. Peck as First Master, William A. Begole as Sr. Warden, and Benjamin L. Remington as Junior Warden. First Master Peck was killed on April 4, 1863, by the collapse of a wooden flume, and buried beneath this tree which was planted at the head of his grave by the brethren at a later date. His monument, the most imposing one in this cemetery, was broken and battered by vandals in recent years. In the ten years of its existence, Mt. Carmel Lodge had only six Masters: Charles M. Peck, William A. Begole, Robert Mc Goun, Robert Curran, Franklin Ennis, and Joseph Beaumont. Mc Goun topped the list with three terms. Begole and Ennis had two terms each. Nineteen of its Charter Members came over from Clay Lodge, No. 101, Dutch Flat, and it moved along in the upper 20 and lower 30 membership brackets, all during its ten years of existence, with a net loss of only 4 and with a peak of 36 in 1867. On August 16, 1872, the faithful few who remained in the Lodge voted to surrender their Charter, and their Lodge was formally declared extinct October 11, 1872. Their Records and Charter presumably went to Grand Lodge in San Francisco, and so were destroyed in the Great Fire of 1906. The end came in July, 1873, when Henry E. Lovejoy, appointed by Grand Lodge to settle Mt. Carmel's affairs, reported on his disposal of what was left of "Real Property and furnishings" as $117.40. Henry Jacob Stehr -- One of three discoverers of gold which founded the town; Builder of the first & main water ditch which furnished the town & the mines with water; Businessman - promoter; died of apparent cancer. Lawrence Stehr -- Son of Henry, 11 years old, drowned in water in an abandoned mining shaft. John R. Mc Quoid -- Logger, died of log rolling on him. John Hartsel -- Died of "illness". Largest funeral in the history of Red Dog and You Bet. John D. Foley -- Gold miner, died of pneumonia. Rachel Mc Leod Chew -- 34 year old wife of Albert Chew, died of consumption. Chew was Irish, not Chinese. 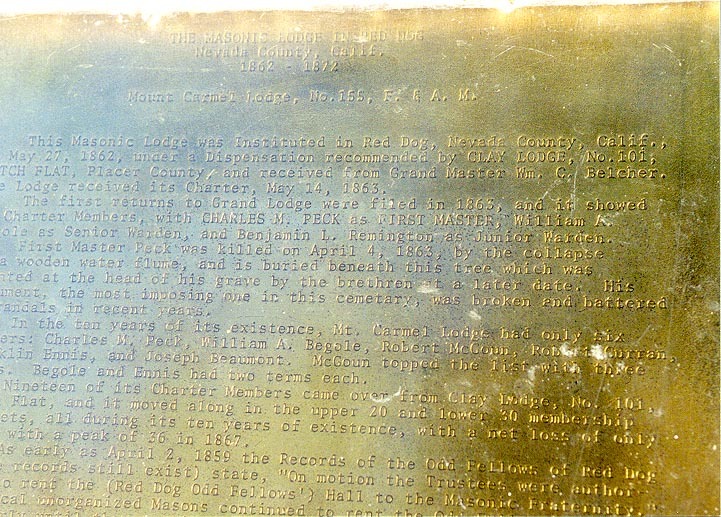 Note: The brass plaque was a project of two young men -- high school age. They researched the information and had the plaque made then erected it. In order to share the information with you, I photographed the plaque, at different angles, in order to be able to read the small engraved letters. 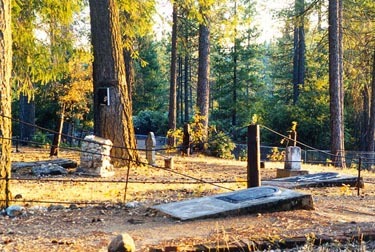 View of the Masonic section of the Red Dog Cemetery. The tombstone closest to the bottom of the picture is outside the "fenced" Masonic area. The standing rockwork holds the brass plaque. The tombstone that lays behind it and next to the tree is that of "Master Charles M. Peck."